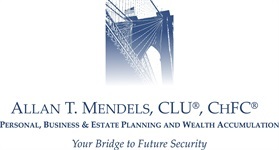 Mendels & Associates is a wealth management practice led by Allan T. Mendels, CLU®, ChFC® with more than 47 years of experiences serving the complex investment, insurance, estate, and business planning needs of high net worth executives and business owners. We offer to serve as your financial concierge, providing a higher level of responsive service designed to simplify the execution of your financial responsibilities and help ensure that all of your personal and business wealth strategies are working cohesively. Our goal is to help you understand your financial objectives so you can make prudent decisions regarding your future and that of your children and grandchildren. These are essential building blocks for creating a BRIDGE that connects today’s reality with possibilities for your children and grandchildren. As an independent practice, we are not tied to any proprietary products, nor do we have any conflicts of interest. Rather than fit you to a product, we find the products that fit your unique objectives. We offer the personal attention and caring nature of a small practice with the resources, tools, and network of a national firm. Our high level of service, flexibility, and attention to detail is seldom found at larger institutions. With an extensive network of professionals, including Money Managers, Pension Actuaries, Group Insurance Specialists, Attorneys, and CPAs, we can assist with a wide array of needs, serving as the quarterback for your team. We believe these are just a few of the reasons why families have worked with us for generations to build their wealth and leave a meaningful legacy.